The weather is getting colder, the days shorter, and our thoughts are turning towards the holiday season. With that, hearty and filling casserole dishes are bound to be a familiar sight on our dinner tables. 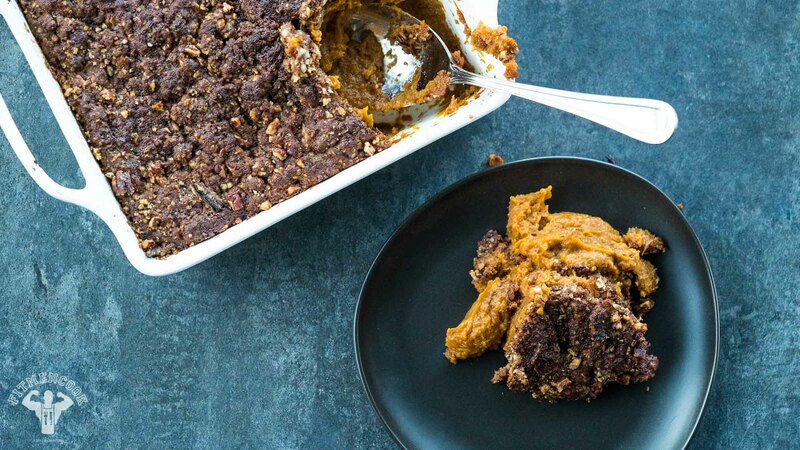 However, just because we’re having them often doesn’t mean it has to be boring, so we’re here to show you a vegan-friendly sweet potato casserole with a pecan crumble topping in place of mini marshmallows. With Thanksgiving, Christmas, and New Years right around the corner, you’ll jump with joy knowing you have this easy holiday recipe. The best thing about this dish is that you can make it ahead of time and have it set aside until right before your guests arrive. Then pop it in a preheated oven for a few minutes and this sweet and savory dish is ready to go! Since it freezes very well, you can rest easy knowing that the ready-made dishes (as long as you wrap tightly in cling wrap) won’t lose flavor or texture. For those who have an instant pot, you can cook it in half the time. Rather than using brown sugar, coconut sugar is used to naturally sweeten this family favorite. Although you can use fresh or canned yams, baked sweet potatoes will add a little bit of smokiness. If you have leftovers, you can use them as filling for a sweet potato pie and the chopped pecan mixture doubles as a crust. Who knew there were so many ways to dress it up? Sweet potatoes are sometimes called yams, but that’s not entirely true since yams and sweet potatoes are actually two different species. They’re not only delicious but full of vitamins and minerals. This power-house of a root vegetable contains ample amounts of vitamin A, E, K, loads of fiber, and, although they may contain more grams of sugar per ounce, they contain fewer calories than regular potatoes. This means you can feel good about feeding your family dishes that are healthy without sacrificing flavor. If you’ve got a green thumb or want to try your hand at garden-to-table dining, they’re easy to grow, and you can eat the greens too. Clearly, we have a lot to be thankful for in the humble sweet potato. Read on below for this quick and easy sweet potato casserole recipe that will amaze the table at your next family Thanksgiving gathering. If you enjoyed this post, drop a comment below to let us know. Wash and peel the sweet potatoes, then chop them into large chunks. Bring a pot of water to a boil and add the potato chunks. Cook until tender, about 15 to 20 minutes. Drain the sweet potato, then place the pieces in a bowl. Quickly mash the potatoes with a fork – this will make them easier to whip using a (hand) mixer. Add the vegan butter, then mix them using a hand mixer for about 1 minute. Then add the remaining ingredients for the filling and mix until smooth and whipped. Add the whipped potatoes to a baking dish and evenly spread them out using a spatula. Bake in the oven for 15 to 17 minutes, or until the top is golden brown. While the filling bakes, add the ingredients for the topping to a food processor and pulse blend. Do not pulverize – you should still have chunks of pecan. Evenly add the topping to the top of the sweet potato filling using a spatula. If desired, sprinkle a little coconut sugar on top. Bake for 25 to 30 minutes, or until the crust is golden brown and crispy to touch. Allow the sweet potato to cool for about 5 to 10 minutes – to allow the crust to further harden – before enjoying.